Not every roundabout gets its own cookie! 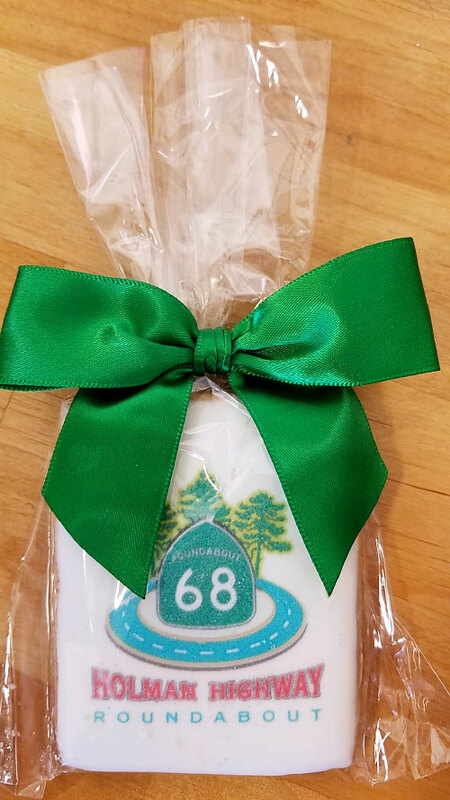 The grand opening celebration of the Holman Highway 68/Highway 1 Roundabout in Monterey, CA included this cookie, and a bumper sticker. Mark Johnson, PE will be presenting at the Ohio Transportation Engineering Conference in Columbus, OH. His presentation “Too Many Crashes at Your Multi-Lane Roundabouts? Learn How to Optimize Safety for Multi-Lane Roundabouts” will be on Oct. 11 at 8am. Multi-lane roundabouts are having excessive PDO or minor crashes, which is creating many challenges for implementation. This presentation details the essential components for designing optimal roundabout safety and operations, and highlights how these elements blend together that affects how drivers process that information and then react to it. See you there at this topical presentation! The webinar will be on Monday, September 18, 2017, from 2:00 PM to 4:00 PM ET and will provide examples of ways the modern roundabout may be able to revitalize a downtown area, enhance a community’s sense of place, and provide a safer and more efficient traffic flow in urban and suburban areas. Presenters will describe how roundabouts have jumpstarted downtown revitalization, illustrate how roundabouts have enhanced communities, and demonstrate how roundabouts have improved traffic flow. Two PDH credits are available. For more information or to register see TRB’s webinar page. 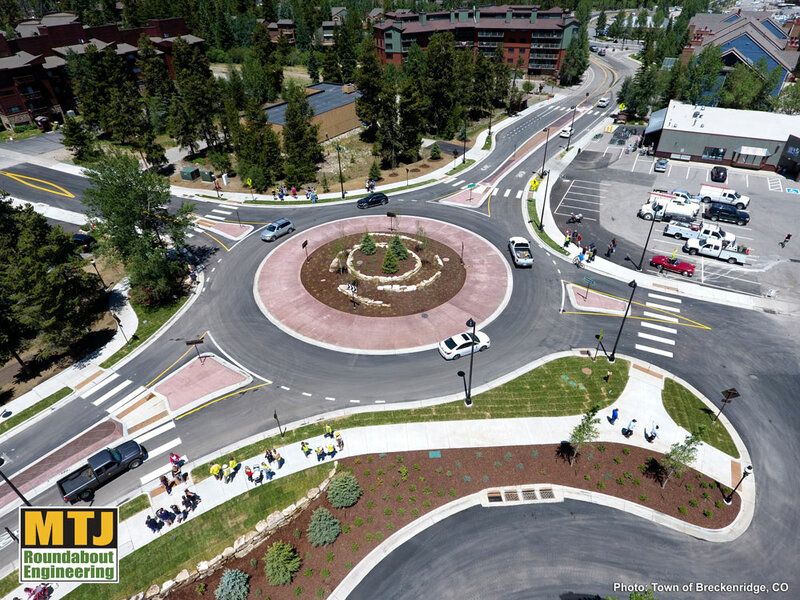 The first roundabout on the Park Ave. Corridor in the Town of Breckenridge, CO is now open! The roundabout at 4 O’Clock Road and Park Avenue held its opening ceremony on June 30, 2017. This is the first roundabout planned along a corridor of nine roundabouts on Park Avenue (SH 9). MTJ Roundabout Engineering worked with the Town of Breckenridge, CO and McDowell Engineering on the peer review for this project. Mark Johnson will be presenting at the ITE Midwestern District Conference in Madison, WI, June 18-20. Mark’s presentation is on the trending topic of “Pedestrian/Vulnerable User Safety and Design Implementation” and will take place Tues., June 20, at 8:00 am. Mark Johnson, PE, will be presenting and moderating at the 2017 Transportation Research Board’s International Roundabout Conference in Green Bay, WI, on May 8-10. Save the date and attend these sessions to learn about these trending topics. May 8, 3:15-4:45 – Presentation of “Design Principles for Safety & Operations of Multi-lane Roundabouts” Session 4B; Design, Ballroom A2. May 9 – 10:15-11:45 Mark Johnson will moderate “Human Factors,” Breakout Session 6C; Ballroom A3. For more information, see the conference program. Mark Johnson will be presenting project highlights with the City of Red Deer and Stantec, Inc. regarding the roundabout project at 67 St. and 30 Ave. in Red Deer, at the 2016 Tri-Party Transportation Conference. The conference will take place March 21-22 in Red Deer, Alberta. Mark Johnson, P.E., MTJ Roundabout Engineering, will present his poster, “Design Optimization for Safety and Operations of Multi-Lane Roundabouts,” at the 2016 TRB Annual Meeting in Washington, D.C. The session, “Diversity of Roundabouts” (Event 789) will be Wednesday, Jan. 13, 2016, 8:30-10:15 AM, in the Convention Center, Hall E; Poster Location Code: K184. Handouts of the poster will be available. Please stop by to hear about this exciting topic. The City of Lincoln, Nebraska, retained MTJ Engineering to complete an in-service design review and provide recommendations to improve the very poor safety record of the roundabout located at the arterial intersection of N. 14th and Superior Streets. The roundabout opened in 2012 built for traffic volumes in the 2030s. MTJ Roundabout Engineering’s recommendations included easing the complexity of the roundabout by reducing the number of lanes and installing fences to keep drivers from seeing the entire intersection as they enter. After the recommended modifications were in place, the number of accidents at the multi-lane roundabout dropped dramatically after the city shut off lanes – just four accidents were reported in October 2013 after the changes, down from 17 accidents in the previous month. See the the full Journal Star article here. The roundabout at River and Roberts Rds. in Lake Barrington, IL is open ahead of schedule! MTJ Roundabout Engineering provided the roundabout and traffic analysis, horizontal design, signing and pavement markings for Phase I (IDS) and Phase II for this challenging and constrained intersection in this developing village of Lake Barrington in Lake County, IL.